The San Francisco Chronicle published a story revealing San Francisco’s staff recommendation for an extended mile of tunnel connecting the Caltrain/High Speed Rail tracks to the Salesforce/Transbay station, along Pennsylvania Avenue. According to the Chron, this alternative would cost $6Billion and could be complete by 2027. The City planning department says that results from the report are expected to be made public in late May. The other alignment option the city was considering, to extend the tunnel out along 3rd street in Mission Bay, would be more expensive, take longer to build, and generate less ridership, based on analysis to date, according to a brief email update to the Citizen Working Group. One question not yet answered by the news article is the alternative for 22nd Street Station. The extended tunnel would go beyond the current location of the station, which isÂ can be reached only by a steep staircase, and has no elevatorsÂ for disability access. The Chronicle story says that Caltrain’s rail yard at 4th and King would be moved, but not where it would be moved to – stay tuned for more information about that. There will also be costs to Caltrain if trains are stored and maintained further from where the trains stop. Stay tuned for more on how those costs are proposed to be handled. If the tunnel isn’t extended, San Francisco would need an additional project, at additional cost and time, to separate the Caltrain tracks from the gnarly intersection of 16th and 7th streets. With increased train traffic from electric Caltrain and eventually high speed rail, at-grade crossing would see long delays for people trying to get into and out of Mission Bay by transit, walking, bicycling or driving. A roadway underpass, as proposed earlier by the California High Speed Rail authority, would cut off local cross streets. Stay tuned for more information and answers to key questions in May. 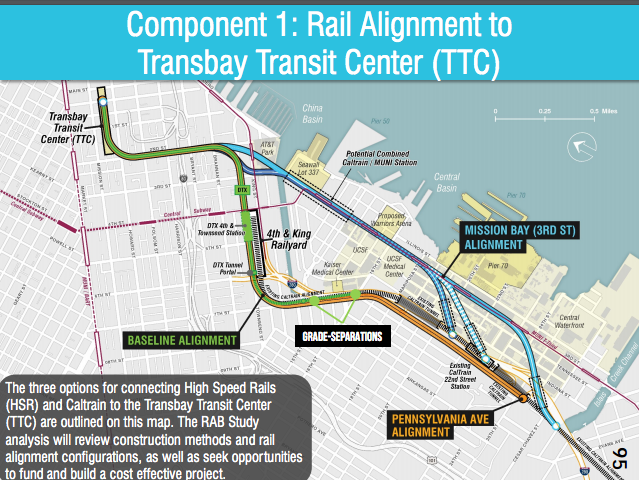 Was tying the Caltrain extension into a second transbay tube within the scope of the study? That’s downright shocking. I am curious to see the cost difference between the baseline alignment and the Pennsylvania alignment, which you can think of as two grade separations– how many billion was that again? That was for 2024 opening date. Push it a couple of years to 2026 and that’s another 10%, but I’m still $1.6 B short, is that the money for two grade separations? @Clem: Well keep in mind they are basically doubling the length of tunneling by going from 7th and King to 25th and Pennsylvania. Iâ€™m not trying to defend this nonsense, just understand. Itâ€™s of course wonderful that weâ€™re also throwing away two (actually three!) existing double track tunnels and a trench. 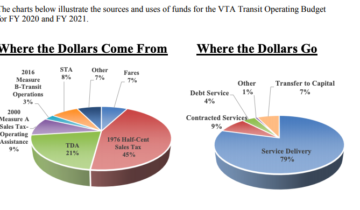 The extra $1.6 billion is more or less what Palo Alto would pay if they insisted on tunnels vs split crossings at Charleston.